September 1st marks Martin and I's 2nd wedding anniversary, since it is right around the corner I thought I would share our wedding story, well wedding adventure is actually more like it! 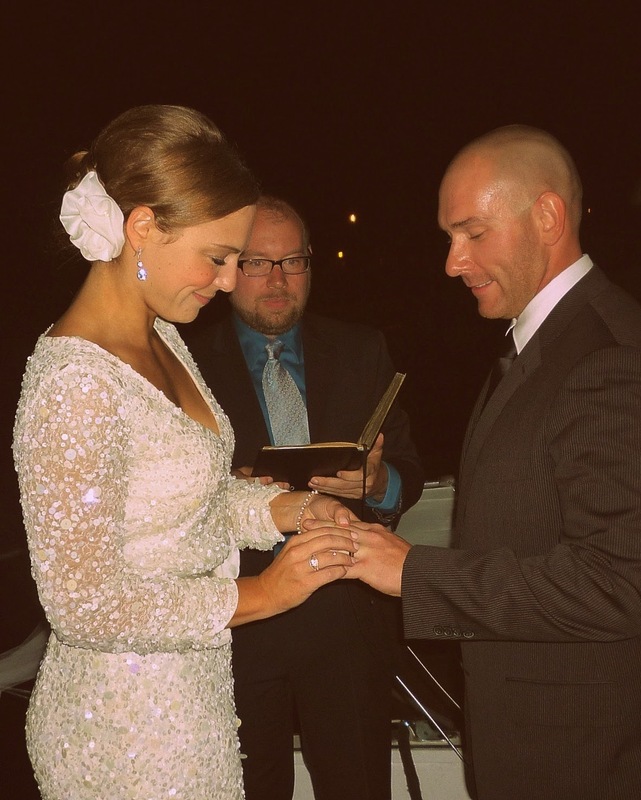 Martin and I always knew that we wanted a smaller, casual, and more intimate wedding, so when the time came we entertained several different option for our big day around the Chicagoland area. 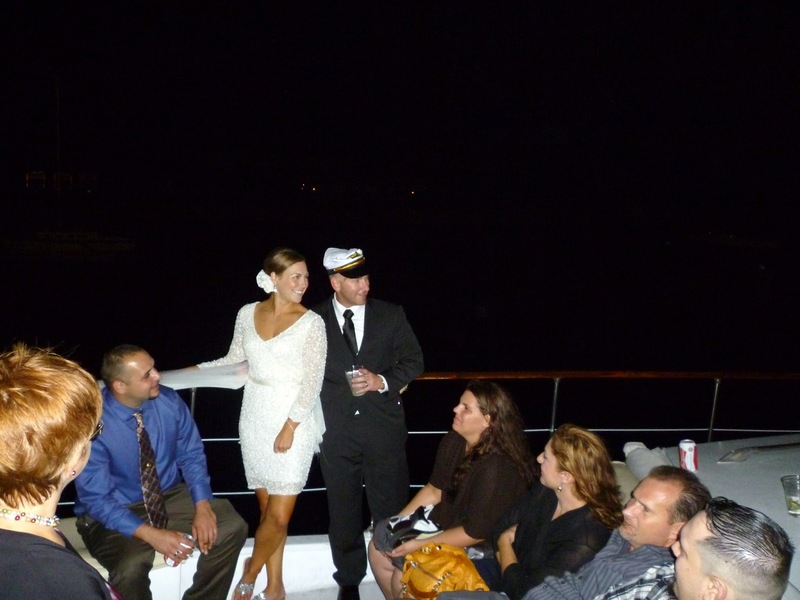 We finally settled on getting married on a yacht on Lake Michigan. 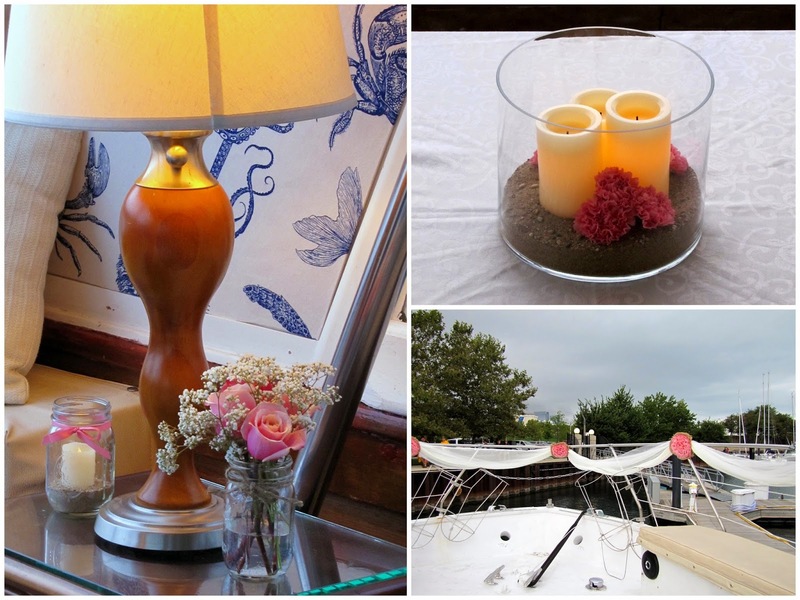 I love being out on the water, and it seemed like something fun for our guests to do. Not only was it a wedding and celebration, but a night out to enjoy the beautiful Chicago lake front. Side note, if you haven't seen the Chicago skyline from the lake, it's a definite must. Now I should preface by saying a few things. We had a great party and a great time, but absolutely nothing went according to plan! If you've been following along here for awhile, you know what a planner I am and though I am increasing my level of flexibility I was actually surprised at how well I handle everything not going to plan that day. It turned out that that weekend we ended up getting the remnants of Hurricane Issac that had made landfall a few days before in Louisiana. We had an evening wedding planned and all day it was gloomy looking, with a few sprinkles here and there with an occasional sliver of sunshine poking through. I just kept telling myself, no big deal it will clear. The good news is it made for some beautiful sunset photos. Speaking of photos, this is where we get into hurdle number 2, though we didn't know it until after everything was said and done. We hired a freelance photographer for our wedding, and everything seemed legit. We had a contract, did engagement photos, had the wedding, and then nothing. She literally disappeared and took our wedding photos with her. Never got to see any of them. That is the one thing I am seriously bummed about, that I don't have more photos documenting our special day. We have a handful of photos that we were able to gather together that friends and family had taken, so at least we have that. 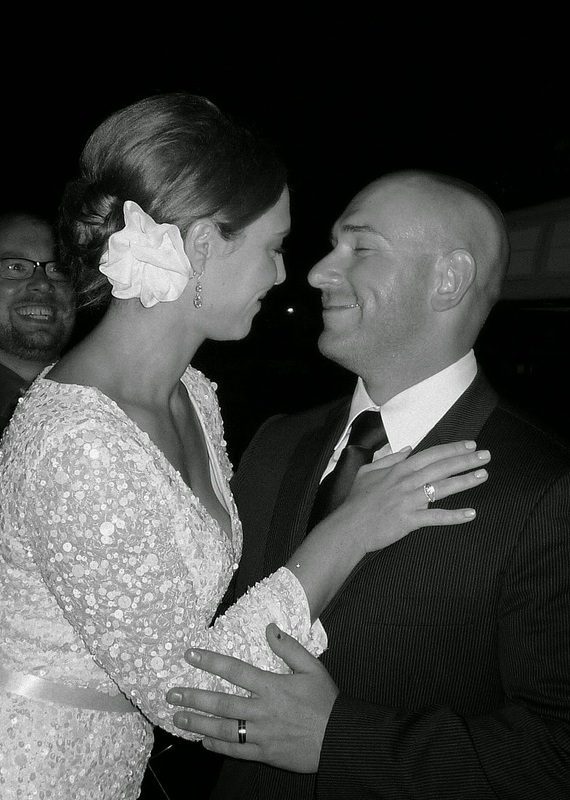 Back to our actual wedding day. We weren't sure what was going to happen with the weather, but so far it had held out and we were good to go. It was time to make our way from the hotel to the harbor to board the yacht. Easy, we were staying about a 10 minutes cab ride from Burnham Harbor. Easy that is if there isn't a game going on at Soldier Field, which in fact there was. Not only was there a game going on, it was just getting out. Now this presented a few new obstacles. One, I never even considered checking if there was going to be a game at Soldier Field that day, lesson learned. Two, when there is a game they shut down the museum campus, which is how you access Burnham Harbor. By shut down I mean, all the roads are closed and blocked off. We luckily had an aggressive cab driver who got us to where we needed to go, but it wasn't the same for all of our guests. Some of our guests got let off by their cabs far away and had to walk over through the campus to the harbor, thankfully everyone eventually made it. Now at this point the weather had still held out, we had finally all made it to the boat, and we were boarded and ready to go. The game plan was to take the boat out in front of Buckingham Fountain for the ceremony, and then we would cruise the Chicago Shoreline afterwards. This is the part where I remind you that we were in the mist of receiving the after math of Hurricane Issac. We came around the wall of the harbor and it was insane. Seriously crazy. The boat started rocking violently from side to side. You could hear all our flowers and candles go crashing of their surfaces. Water was coming up over the sides, I seriously thought we were all going overboard! Needless to say, that didn't last for long before I told the captain to turn the boat back around and get inside the safe walls of the harbor again. I couldn't believe he hadn't mentioned anything to me before we headed out, like the water is a little rough, something. . .anything! Exchanging rings, officiated by our good friend Chuck. 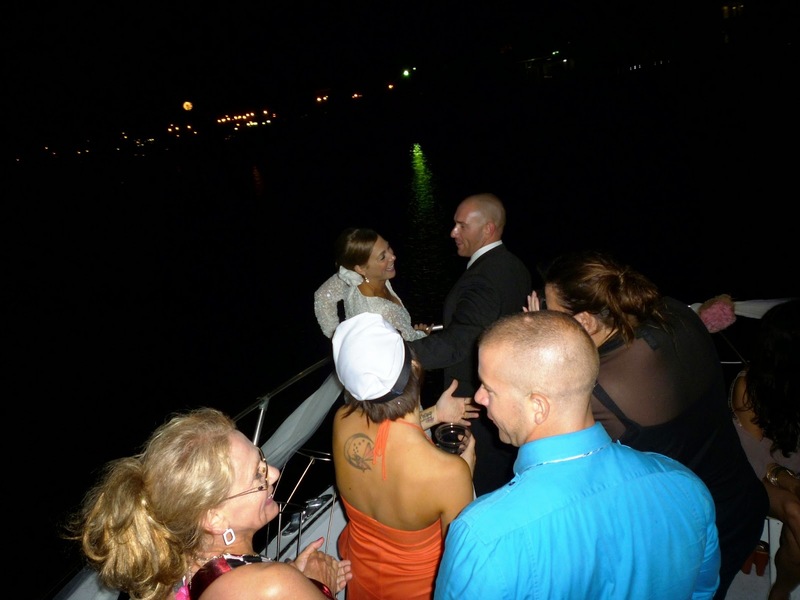 Once we got safely back into the harbor we were able to have our ceremony and enjoy the evening with our friends and family. Though it turned out different than expected, it is a night I will never forget! I definitely look forward to some day renewing our vows in a very peaceful, calming occasion! I absolutely love this story - it just goes to show that regardless of what happens on your wedding day, you still get to marry the love of your life and that's all that matters! Let's briefly discuss your dress - um, I want it. You were a stunning bride! I'm so sad for you that you didn't get any of your wedding photos - you literally never heard from the girl ever again? That's so shady. At least friends and family took pictures! You are so sweet! The best part about that dress is I've since used it for other occasions. I am seriously bummed about the photos, the worst part is she already had our money :(, seriously who does that?! We even went to the address we had for her, and nothing! It is definitely an adventure we will never forget! I am seriously bummed about the photos, part of me keeps hoping one day they will turn up, though that will never happen! Oh My Gosh...I would KILL that photographer! I'm so sorry...but you do have some pretty great photos that you posted above. I love love love the one of you exchanging rings! You looked beautiful! I'm seriously impressed with how well you just "rolled with the punches!" I still want to kill that photographer every time I think about it! It's amazing what you can roll with when you have no other option, and there are people around!